Why should you choose a paintball birthday party to celebrate you or a loved ones big day? It’s hard sometimes to know what to do for a birthday. After awhile it seems like all of the creative options have been used, and you’re left with the mundane. However, if you’ve got a birthday to plan and you do feel out of options, Air Assault Paintball Games is here to save the day. Why not try organizing a paintball birthday party? It’s fun, physical, and good for any group. It’s also a great way to work off that cake-fueled sugar rush. Air Assault Paintball Games does not require that you’ve a large party. We offer walk-on experience certain days each week, where no bookings are needed. 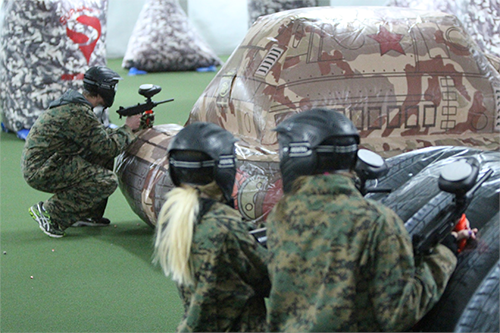 Regardless of what your party size, Air Assault Paintball Games will help you organize the right paintball birthday party. We’re happy to help you inside your advance bookings, so make sure to give them a call as quickly as possible to arrange an enjoyable-filled and active birthday that won’t soon be forgotten. Air Assault Paintball Games’ experienced and friendly staff can help you discover which playing area fits your needs. Should you have non-playing people from the party, a few of their fields are even spectator friendly. Even grandmother can savor the paintball birthday party fun in the sidelines that’s if she does not choose to play too! Let us make your paintball birthday party awesome! Make sure you give us a call at 651-222-0300 with any questions you may have about hosting a private group outing or to begin the booking process.